Mattress toppers have been gaining more market presence in the recent years. But to this day, we still get daily queries about it - many are still confused about what it does. This article will explain to you what a topper is, why you should consider it, and when you should actually buy one. A mattress topper is a removable layer that sits on top of a mattress to provide cushioning and support. There are two general purposes that mattress toppers serve: 1) make a firm mattress softer, or 2) remedy a shabby, sagging mattress. The terms mattress topper and mattress pad are often confused. Technically speaking they're not the same. Mattress pads are usually thin layers of material made to protect the mattress from moisture, dust mites, and bacteria. While cushioning is not a mattress pad’s main purpose, it can give added comfort as well. Mattress toppers are type of thick mattress pad that both provide protection and comfort to sleepers - two birds, as they say. A mattress topper can be made of different materials. Depending on the material, the pros and cons of the topper will change. If you are allergic to some materials - such as latex or feathers - it’s worth your while considering other toppers. Memory foam toppers offer a good balance of comfort and support. It’s soft yet supportive. Memory foam can mould to the body and evenly distributes a sleeper’s weight. This also reduces partner disturbance. A well-engineered mattress topper should have a built-in cooling mechanism to fight any tendencies of memory foam to be hot. Shop the Ecosa memory foam mattress topper. Cotton & Polyester-Blend toppers tend to be one of the cheapest in the market. They mimic the feeling of sleeping on a featherbed topper - light and generally breathable. The downside is that they can easily wear-out. The fills tend to move from one side to another - unable to offer long-lasting comfort with very low support. Latex toppers are made from a natural material naturally resistant to dust mites and bacteria. It’s hypoallergenic - except for latex allergy sufferers. However, it’s on the more expensive end of the topper spectrum. It can also lead to discolouration and crumbling in the long run due to oxidation. Wool toppers are one of the most expensive toppers in the market. They are thermal regulating but are not as commonly found as other materials. Feather toppers are one of the softest toppers in the market. Their feel is similar to that of a feather-filled duvet. Like cotton and polyester-blend toppers, the feathers can get lumped on one side more than another thereby losing relevant support for the body. Feathers can leak and escape the fabric as well. 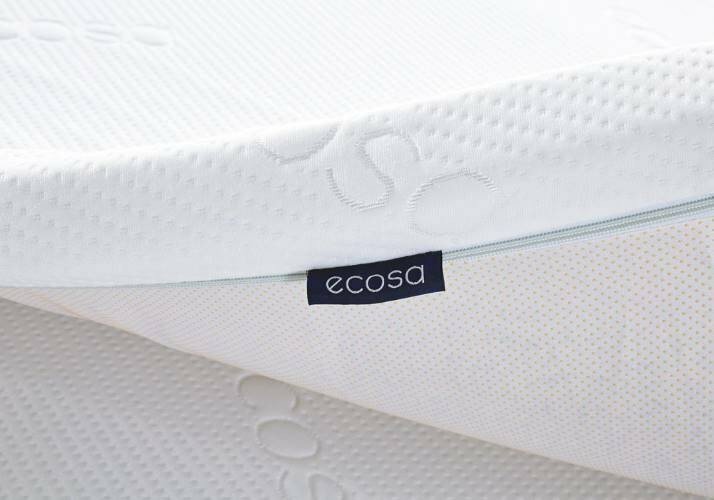 The Ecosa topper has two layers of memory foam: charcoal-infused memory foam to keep the surface soft, and gel-infused memory foam to provide extra support. Sometimes getting a topper can be counterproductive. So how do you know if you should really get one? How old is your mattress? Has it started sagging? A good mattress topper can provide extra cushioning. Their main purpose is to make mattresses softer and more comfortable. So if you’re considering a mattress only because you find your mattress too firm for your liking, a topper is the way to go. Mattresses, depending on the material and care, are expected to last between 5-10 years. If your mattress shows signs of wear-and-tear such as sagging, a topper may be quite an expensive and short-term fix for it. Instead, consider investing in a new mattress that can last you the next 10-15 years. There are many mattress toppers out there in the market, but the right ones will serve their purpose for a longer period. A balance of comfort and support is optimum. Opt for a topper to keep your body cushioned, cradled, and supported throughout the night. Shop the Ecosa mattress topper now.